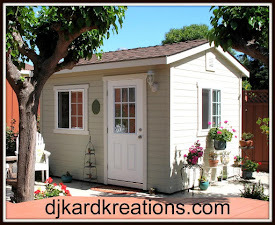 djkardkreations: The 25th = PTI & Rudolph & Pixie! The 25th = PTI & Rudolph & Pixie! Greetings, my friends! Happy Sunday Funday! Short and sweet today as you are no doubt here to hop and unless you're very athletic, it get tiresome to stand and hop in place for any length of time. I chose to use the ornaments for my inspiration so I could use my NBUS "Ornament Trio Cutout" from Poppystamps. I used nontraditional PTI DSP for my die cut inserts and for the matting. The NBUS sediment is from PTI's "Stocking Prints" stamp set. Now you might think this is tiresome fiddly work putting all those pieces into the negative bits, but I'm a person with a hamster to help me and we both enjoy jigsaw puzzles ... this way we can get that same jigsaw satisfaction and make cards at the same time! 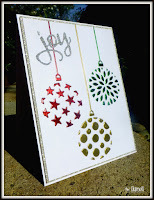 I'm entering this metallic version in Rudolph Days Challenge hosted by the sweet Maureen. This challenge opens every month for Christmas cards and runs from the 25th day to the last day of each month throughout the year! 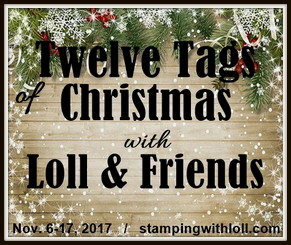 I hope you can join in! I'm also entering my card in Pixie's Snippets Playground. This is the 200th challenge run by the sweet and talented Di Wray! 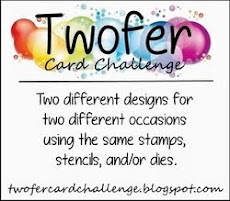 This challenge is simply to encourage all of us to use our scraps ~ or snippets as my British friends say ~ and that's it! EZPZ! We all have scads of them and I find this challenge a wonderful reminder to use mine; just like my NBUS acronym reminds me to use my new product. Not only that, but the ladies who join in are a HOOT! We have a Playground and a head mistress and a mascot and a tree house and a bike shed and swings and a donkey ... oh, and so much more! There are prizes, too! It's been great fun seeing a lot of my friends join in across the pond and I hope you can, too! Congratulations, Di, and thank you for all you do!! I was looking at those ornaments...and thinking I could do snowflakes and then went another direction...am loving the spectrum of color on your fabulous dies. So cool Darnell! Pretty cards! I've enjoyed that die from afar for awhile, I just love Christmas ornaments. Great shine, great colors! You are plainly blessed with more patience than me!!! These are gorgeous, Darnell. Rushing over to Darnell's Playhouse to comment! Above 20! Miracle! Hi sweet Darnell. 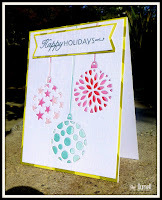 2 clever and festive ornament cards! Both soon to be CASE-d by me! Love them! You always amaze! ooooohhhh.....love those ornaments! Both cards are simply awesome Darnell! Gorgeous Darnell! Those ornaments are gorgeous!! Darnell your cards are fabulous! I love those ornaments and how you coloured them--cool! they are fab baubles- you must be patient! Gr8 Christmas cards. LOVE your bauble cards Darnell. PSST: Come and see me behind the bike sheds - we are having an illicit 200th week party. And there's apple bobbing . . . and we might just have some rockets and loud bangers to set off. Shhhh! Both are so pretty Darnell! My favorite is the one with metallic inlaid paper. Awesome job! Big hugs! It always amazes me how different cards can look just by changing the colors! Love the shine on the second one and the nontraditional papers on the first! Great die and beautiful cards! Gorgeous inlays on both of these Darnell! 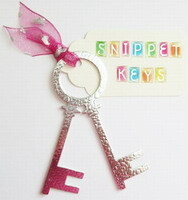 Nice way to use this die one of my versatile favorites! Hop in one place...haha! My humming bird feeders come today and I cannot wait to use them. Hugs to you both! wow, wow, wow, Darnell! These are so gorgeous! I love them both! What a wonderful contrast between the two, pastel and mirror card. Stunning! Darnell, these are all gorgeous. Loaded with awesomeness and lots of patience, Darnell. Definitely worth the effort though as both cards are beautiful. Thanks for taking part in the October Rudolph Days Challenge. Oh wow! These are so pretty! Love the colors on the second one. Great cards for the holidays. Beautiful cards! So much work put into them, they are very eye catching. The designs are so great a always. Wonderful work involving Hammy too. 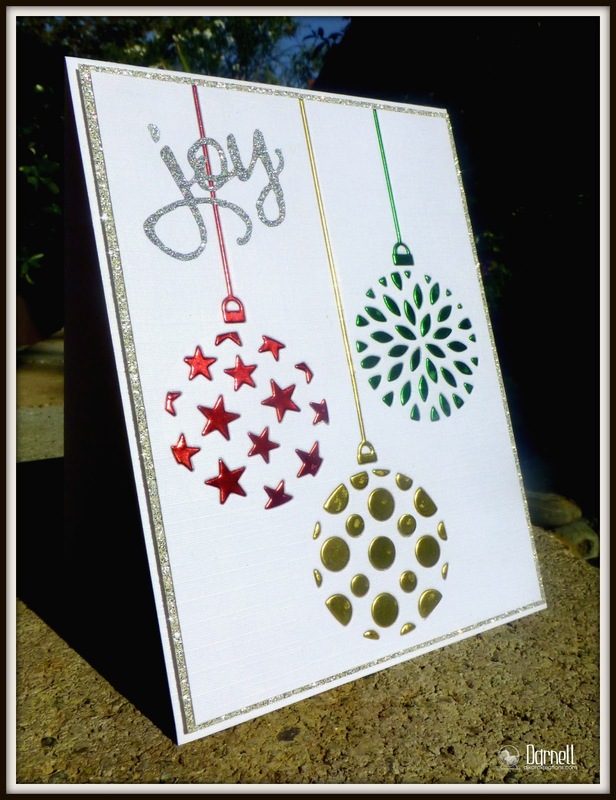 I always love Christmas ornament cards and yours you created are absolutely wonderful! And, well worth the time you and Hammy took to fit all the pieces together. Darnell these are both FABULOUS!!!!! Love Christmas ornaments! What a great die! 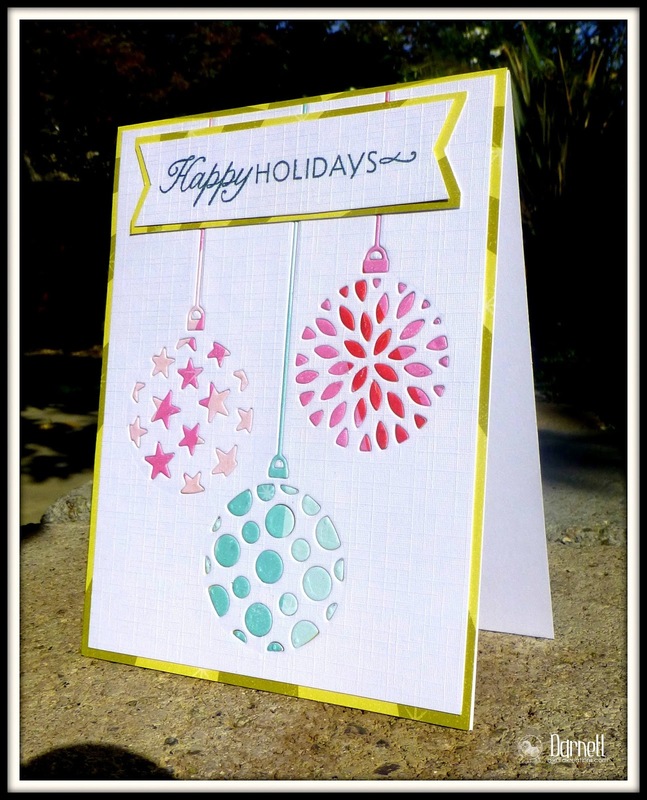 Incredibly beautiful ornaments on both your cards! Fabulously designed! Soooooo pretty. I feel another winner coming on. Partial to this inlaid diecutting and this die is a must have, seems to me. Perfect for this tech-ni-cue. Whoa!! Those inlaid die cut cards are just gorgeous...even though they must take a looooooong time to make this beautiful. Both versions are fabulous but I have to say that the one with the mirror paper really knocks my socks off. This just shows that clean and simple can still be spectacular! Two very pretty cards, dear Darnell. I like the sparkle shine on your "twofer". Such awesome cards, Darnell! Those ornaments are so fun! Both yours cards are just stunning, Darnell!! Such a great way to make CAS! Love, love these ornaments!! The first one card is really spectacular!!! You have made very busy, but the result of your jigsaw puzzle is simply fabulous!! 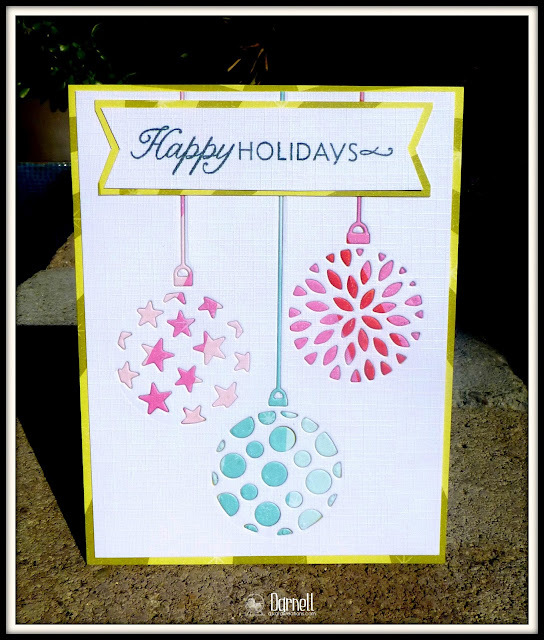 Fabulous Bauble die, and fabulous cards you made with it as well. I especially like the second one with the shiny colours. OH I just love your shiny little bauble cards, Darnell! I'm loving that die cut! Beautiful Christmas cards, Darnell! I especially love the metallic ornaments! You are so fortunate, having a hamster helping you with your cards! Maybe that's what I need? Darnell, you really are the limit but you sure make awesome cards! Love these. Oh wow!! These are so pretty! I love the color combos. And I really like the shiny card. How pretty! I love the shimmer! Beautiful, beautiful, Miss Darnell. I love these cards. All that shine makes me happy! Darnell, what beautiful cards you've created. I love how you captured the shine. What lovely cards!! I really like the second one with the SHINE!! Christmas = shine to me for some reason. FABULOUS design!! These are gorgeous! LOVING those ornaments!!!!!!!!!!!!!!!!!!!! Such wonderful ornament Christmas cards! Love the different shades of color and shimmer. So very pretty! The ornaments look fabulous! Happy hopping! Amazing cards!! Those ornaments are so beautiful. 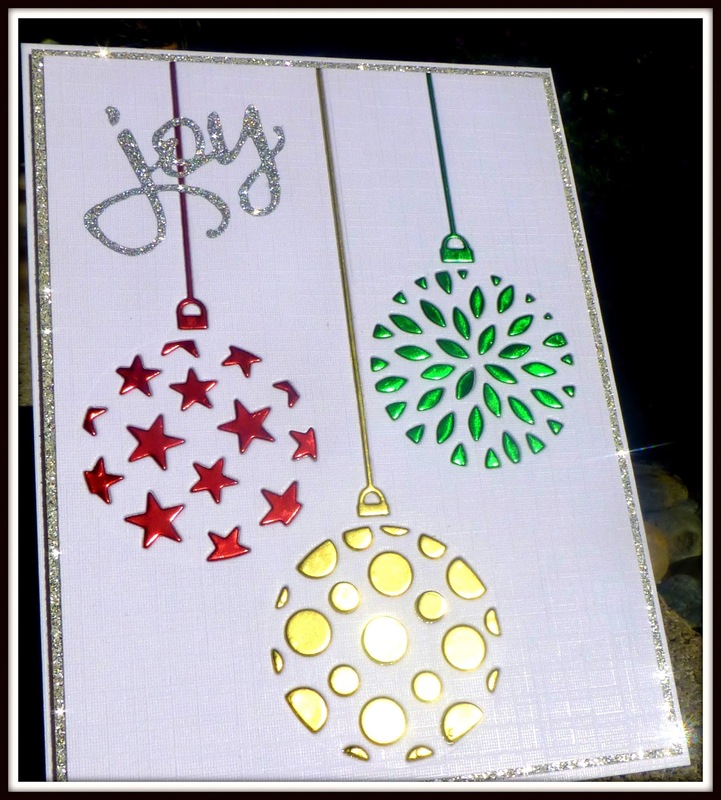 Fabulous cards - it would kill me to pop all those pieces in - but great result - especially the shining one:) lovely!!!! I just love what you have done. I really need to try this technique. You are very inspiring. These cards look amazing! That's a great die-cut. Must be a little fiddly putting all those pieces back in, but hoo-boy, is it worth it! Love the results. Love these ornaments in your non traditional colors. Fantastic cards. Beautiful cards Darnell! So sweet! It looks amazing with those shine! Absolutely gorgeous, but oooooooh the thought of putting all those tiny pieces into those openings! I'm not the most patient person in the world, I've had nightmares about stuff less fiddly than that. You must be an absolute model of patience to do it all twice over! Love both your cards. Such a pretty die & I admire your patience but it's well worth it. Hi Darnell - wow and double wow! Two stunning cards there and what immense patience you have! I can't pick a favourite between the two, both just fabulous!! And thank you so much for your very sweet words here - the Playground is a lovely place to run round in, even when searching for illicit cider! Beautiful cards, Darnell! Love the shiny ornaments. I wondered what one would do with this die! I'm glad to see now and admire your patience in finding and putting all those little pieces back in! Darnell, naredila si dve krasni, sijoči božični voščilnici! Love your SACAS cards, Darnell!!! Those ornament are so beautiful!!! Think I should get those dies - I love to do puzzles!!!! Dear Darnell, these cards are totally gorgeous. Sheer genius idea to combine the die cuts. It looks really beautiful and very stylish. I love these. Hope all is well with you. Beautiful ornaments, Darnell! Love the pretty shine! It never stops to amaze me the impact colors have on a design. These cards, very similar designs, yet very different looks. I love this kind of post, so inspirational. I love those ornaments. Very pretty! I love the colors you choose for both cards. Beautiful!!! Such amazing and awesome cards - love how they turned out and I applaud you and hammy on the meticulous accuracy with which you made these stunning cards!!! Sheering really loudly for you, can you hear me??? Have a wonderful day!! These ornament cards are so stunning Darnell, anyone would be excited to receive them!! Lovely cards Darnell you and Hammy are to be commended on your patience! Darnell these are so beautiful! Love those dies and the shine is gorgeous in the photo's so must be amazing IRL. I hope you and the Mistah are doing well hun, sorry I can't be around much right now as I'm struggling health wise. I just noticed your update below - I have had this with my OH and he is on warfarin for it permanently. It will settle eventually is all I can tell you - for some it is quicker than others. Two stunning cards and although you like jigsaws I bet keeping hold of all the pieces was tricky, I know from a similar experience! Thanks for joining in with Rudolph Day this month. These are lovely Darnell, the ornaments are so pretty!! The ornaments are gorgeous, and fiddling around with negatives like this is one of my favorite things to do! I love the varied colors and shapes! You are a very patient crafter, maybe I will give this technique a try! 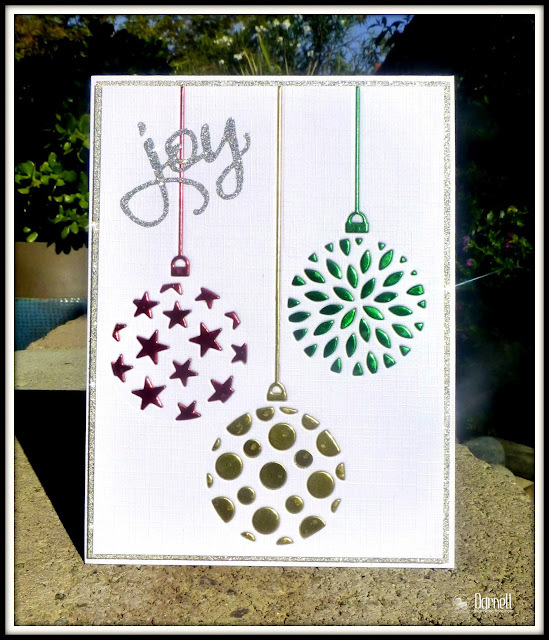 Gorgeous ornament cards Darnell! The shine you captured is eye candy! Fantastic cards and good for you to puzzle on through...so worth the efforts! I admire your patience, Darnell, and the festive feeling. Very clever use of the dies. Love your SACAS cards, Darnell. I like jigsaw puzzles too but their pieces aren't quite as tiny and these. That is one lovely die and it looks good no matter what paper you use - colored or metallic. So pretty Darnell.... I just love those ornaments! Festive and fun. Have a great day! Wowzer!! Just love these cards Darnell. So clever. Hugs to you and Hammy! You & Hammy always amaze! Two extremely beautiful, glistening (and no doubt very fiddly) cards. Bet Hammy's little fingers came in handy for inlaying the intricate tiny bits! Tell him he did an outstanding job. Love this, with the jewel colors on these pretty ornaments. And you did TWO! My hat's off to you, (but then I don't have a Hammy...good excuse, hey?). Thanks for sharing your genius to brighten the day with these 2 pretties. Hugs!